If you missed it, Part 2 is here. We did not discuss Team Writing in the previous two parts, so I will touch on it here. This is a very different situation than writing the entire story yourself. Let me explain. I have had three writing partners over the years, some good some bad, in the end I prefer writing solo because it suits me. As with anything, there are positives and negatives to this arrangement. A squabble could ruin your relationship leading to problems with story rights and ownership issues. This is a big one for me. Let’s say you just co-wrote the world’s greatest graphic novel with a partner and you get into a fight. He says; “You can’t make this story because I wrote half of it. If you do, I will sue you.” Great, you might as well shelve the idea at that point because the last things you need to kill creativity are legal problems. 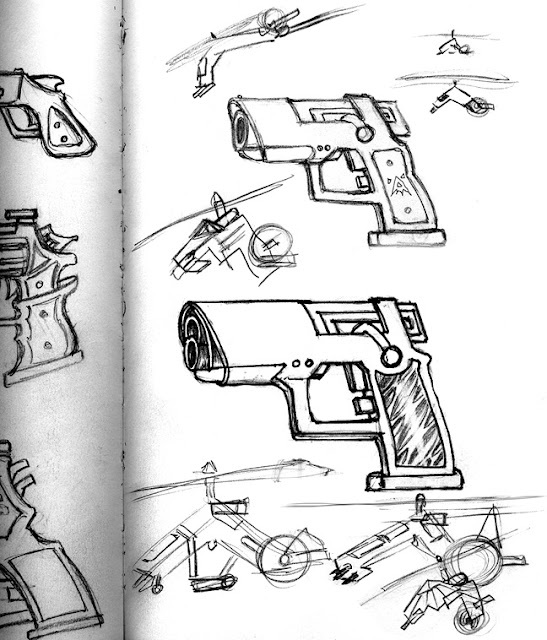 Subway sketches of advanced helicopters and futuristic firearms. I try to draw something every day. Sometimes it leads to nothing, but sometimes it solves a problem. In this case, my guns lead me to helicopters, and my helicopters lead me to my final helicopter which ends up in the book. 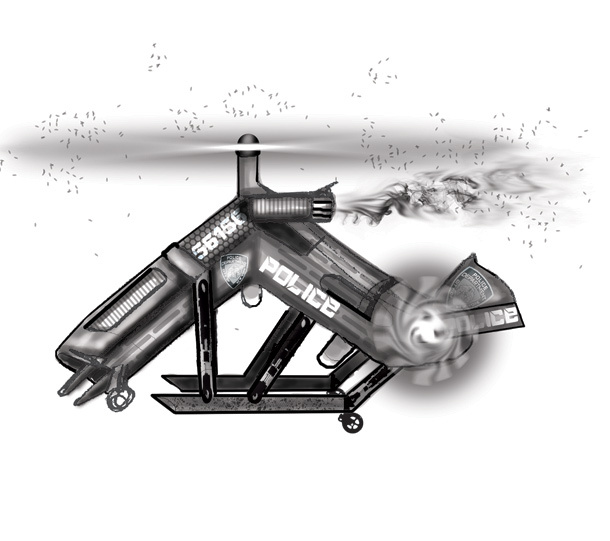 Here is a look at the final advanced helicopter derived from my rough Subway sketches, you can see the progression and that sketching lets you work out your ideas just like a scientist tests their theories. My recommendations here are, “Be careful.” Writing in a team environment is done all the time in TV and Film, there are actually very few writers that write alone in these industries. There are many successful writing teams, but they are usually best friends, brothers or sisters, or as stated previously, they work for a major company. Some examples of successful teams are the Academy Award-winning work of the Coen Brothers, Wachowski, Farrelly, and Weitz brothers and the Ephron sisters. A team should have complimentary strengths, like Ron Howard and Brian Grazer. Example, one person is technical, and the other is good with emotional material. The last thing is this; it is very common for a writer and an artist to get together on a story in the comic book world. Usually writers can’t draw, and artists can’t write, just take your ego out of the equation and you’ll be OK. For the purpose of this blog series, I am writing this from the perspective that you can do both. Stephen King and Joe Hill collaborated on this to adapt Richard Matheson's classic suspense tale, DUEL! Most professional comic books are based on teamwork, but if you are dead set on doing on your own keep reading. Moving on, now let’s say you have finished your story after several months of work, now you need to polish that story before you can move on. Take your story and format it so that you understand how to break out the words into pictures later on. Go back to the links provided in Step 2 and see how it’s done professionally. If you've already written it in comic format then you have no worries, skip down to grammar. If you have written your story in screenplay format, illustrated below is the formula that I use. A graphic novel is typically a minimum of 99 pages up to 300 or more. 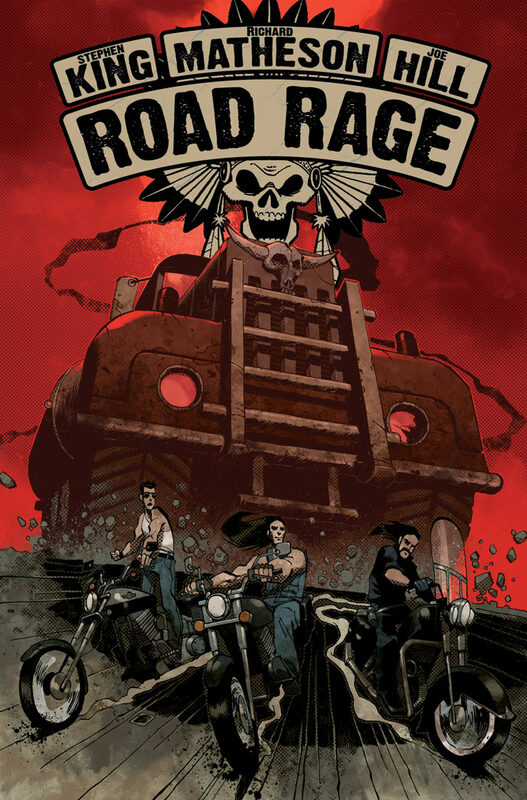 An average graphic novel is about 100 to 150 pages. Some people may complain about this, but it’s not a rule it is a guideline, the whole thing is really up to you. However, let me say this, if you were writing your first novel and you told your friends, “Hey I just wrote my first novel.” Everyone gets excited and then ask you, “How many pages is it?” You say, “Its 48 pages long!” They smirk and most of them would say, well, that really isn't a novel is it. I know we are comparing apples to oranges here with a novel vs. a graphic novel, but the problem is the same. If you want the respect of making a graphic novel, then it should be long enough to fit that category. Otherwise, you could just make a one-shot comic book. 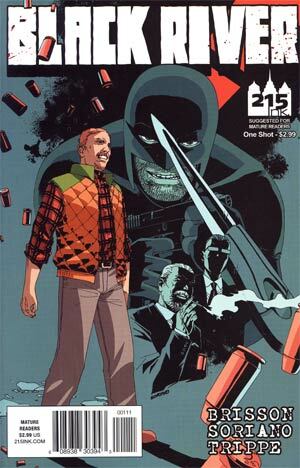 This is an example of a Pilot Story or a One-Shot comic book. The idea here is that if the public respond favorably, just like a new TV series, then you can make a series or a graphic novel out of it. It is kind of a test bed for new artists and writers. As well as the tried and proven. Some make it and some don't. If you are writing in a professional comic book format, its page for page most of the time. That means one page of writing is equal to one page of comic art. A comic book is 32 pages in length period. Usually, it's 22 - 25 pages of story and the remainder is advertisements and credit or title pages, etc…, but the total never exceeds 32 pages. 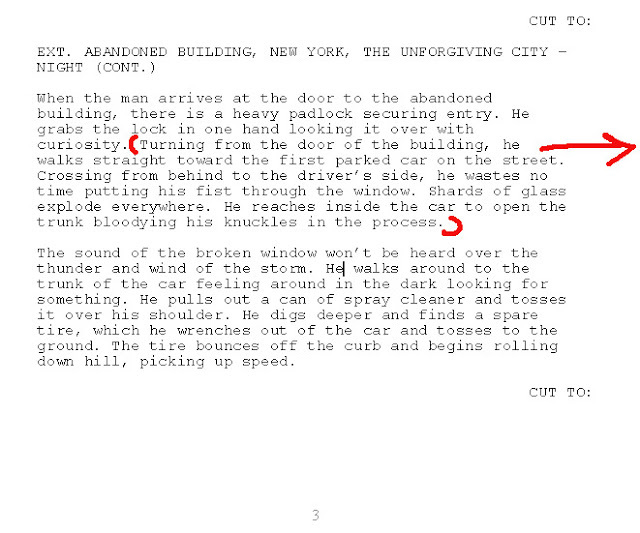 If you are writing in film script format, here is the rule of thumb that I use to break down my script. This will be covered in more detail later when I storyboard my script. For now, the average film script is between 99 and 120 pages in length. When I break down the action on one page of my story, it equals to 3 to 4 comic book pages. That means that every 12 pages of written film script format are equal to approximately one full 32-page comic book. Do you see where I am going with this? 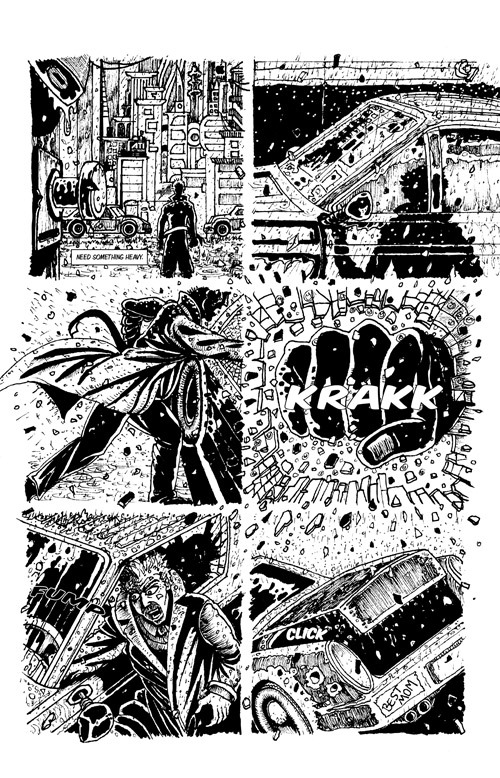 Above is an example of my screenplay writing, illustrated into panels for a full page of my graphic novel. 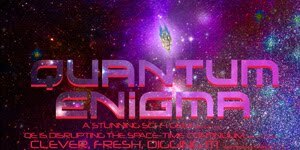 What I’m attempting to do here is show you that you can write in any manner that you are comfortable with, and then adapt it to the Graphic Novel Format. This way you won’t have to change your writing style to something that doesn't feel natural to you. The third option is that you write in novel format. If this is the case, just write and make it good. We’ll get into breaking down the action in a story and turning it into art later. 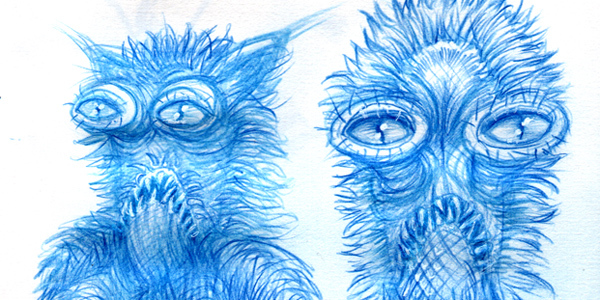 Whatever you do, don't stop sketching during the writing process. Believe me, writing can sometimes be very tedious work and you'll need to keep your imagination free flowing. 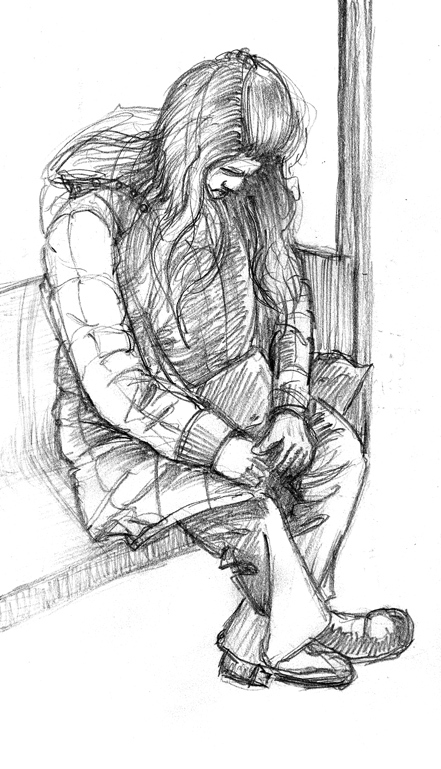 As I said before, I sketch on the Subways every day. It helps me with anatomy, weight, and balance. If you don't have a subway, go to a mall or coffee shop. This is my weakest area. Grammar and punctuation are just killers for me. If I focus too much on sentence structure and verb tense, it stifles my creativity, but it has to be done. Grammar and punctuation are the mechanics of writing. Just like knowing how to draw anatomy is essential for drawing comic books, they are the mechanics of this art form. My art instructor once told me that you have to know the rules before you can break them. I don’t know if he was the one that quoted this, or borrowed it from someone else, but I get it. In the end, it really comes down to learning and education. I am not saying that every writer or artist needs a formal education, but it helps a lot. If you don’t have these writing skills then you must learn as you go along, or go back to school. 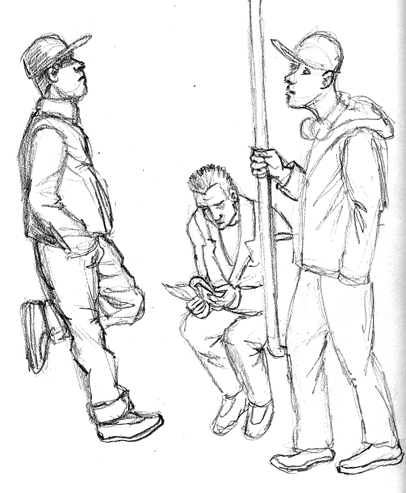 More sketches from the underground. I am sure that these writers questioned themselves at some point, but in the end, not having a formal education didn't stop them either. Agatha Christie, Roald Dahl, Jack London, Nora Roberts, John Steinbeck, Mark Twain. Even if your grammar and punctuation isn't the best, you should keep writing. You can always learn the technical stuff and write it better later. There is many great style and grammar references on the web, including some software to help you, here are just a few that I use. Copyrighting and protecting your work is essential too. 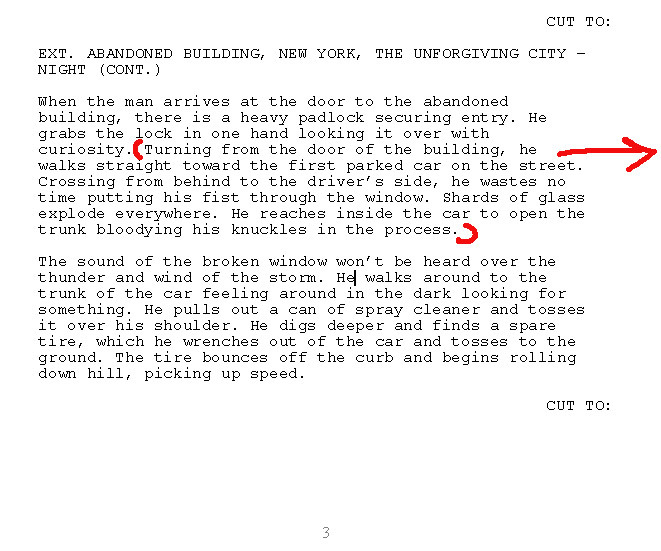 Once you have a finalized script, send it off for copyrighting to either one or both of these. It’s not expensive and you will want the peace of mind and protection. After it's written and you have edited the story, checked the grammar, spell checked it, and you are generally pleased with your story, then let friends read it. Get some good feedback and then rewrite it again. Listen to criticism, it's OK. You would rather have someone you know give you feedback on it now, then a comic review critic shred you later. Why am I spending so much time on writing, instead of the art, because, every great graphic novel starts with a great story. How do you get a great story? You write it. Click Here For Part 4..., Drawing Supplies and Tools.